In an initial public offering, a company sells its stock, for the first time, to public investors. The company hires investment banks to underwrite its offering. The investment banks, through some combination of discounted cashflow models and looking at comparable companies and having a sense of investor appetite and general market conditions, come up with a rough range of valuations for the company. They tell the company that range, and if the company disagrees then some sort of negotiation ensues. Maybe the company convinces the banks that it’s worth more, or maybe the banks convince the company that it’s not, or maybe the banks say “we can go out at your range but we’re warning you now it will go poorly”. Or maybe the company decides not to go ahead with the IPO, or whatever. 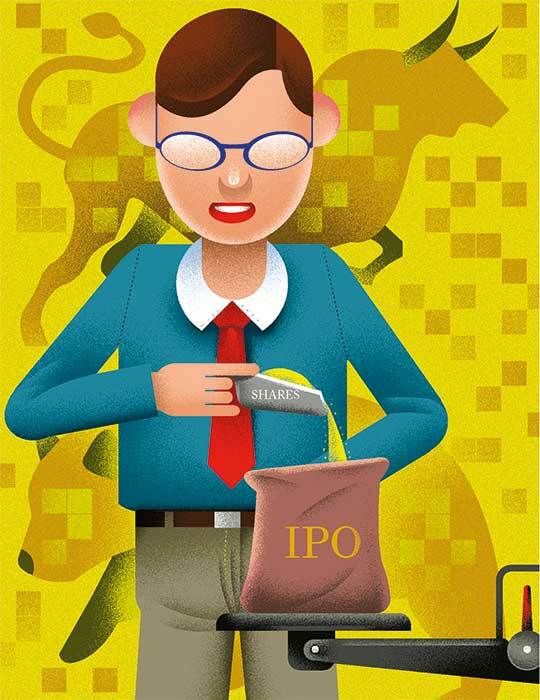 Once the banks and company are agreed on a rough price range, they launch the IPO and market it to investors. And then a sort of combination auction-negotiation ensues: The investors put in orders at the top, middle, or bottom of the price range, or they call up the banks and say “this price range is way too high but we’d buy it at a lower price”, and the banks try to convince them to buy at a higher price. The negotiation involves both valuation arguments (about cashflows or whatever) and also an auction component (if there are plenty of orders at the top of the price range, the banks will simply ignore your argument that the company isn’t worth that much). Perhaps the price range gets revised—up if there’s plenty of demand, down if there’s not enough. Eventually the banks have sufficient orders to buy all the stock at some clearing price in or above or below the price range, and the IPO shares are sold at that price. The next day the stock opens for trading, and a market price is established, and that market price is only loosely related to the price established by all of that negotiation. (Usually it’s higher.) People find this process sort of unsatisfying, and I have laid it out so explicitly above so you can see why. Like that whole process makes sense, it’s customary, it’s been arrived at through decades of experience, but at the same time it just feels very ad hoc and unscientific and loosey-goosey. Step 8 — the part where the trading price is wildly different from and usually significantly higher than the IPO price—is particularly galling. People — smart people, powerful people, tech-oriented people, iconoclastic world-changing people, etc.—decide to take their companies public, and someone explains to them that this is how it works, and they are like, “well that sounds dumb”. And occasionally they suggest doing it some other way. And mostly their bankers sigh heavily and say things like “this is a critical moment in your company’s life, are you sure that you want to do something risky that the market isn’t used to,” and mostly they back down. Occasionally they don’t. Google’s IPO remains famous 14 years later because almost everyone since then has just done a normal IPO. But when Spotify Technology SA went public this year, it did something even weirder than Google and skipped directly to step 8: It didn’t sell stock, didn’t hire underwriters, didn’t negotiate a price, it just opened the stock for trading and watched what happened. Companies can get huge and famous and raise lots of money without going public; an IPO is now more of a straightforward financing transaction and less of a mystical rite of passage than it used to be. And so if you want to do weird stuff, do weird stuff, knock yourself out, it’s not that big a deal. As an aficionado of weird capital-markets stuff, I am excited for this development. SoftBank Group Corp. dispensed with a price range and chose to set a single preliminary figure for the $21 billion (Dh77 billion) initial public offering of its Japanese telecom business, showing that the company and its bankers are confident of their ability to gauge demand. It’s the first time that a stock will debut on the Tokyo Stock Exchange without a range, one of the lead underwriters said. The Japanese technology giant plans to sell shares for 1,500 yen (Dh48.7) apiece, the same price that it indicated when announcing the IPO. It is the opposite of the Google approach: Whereas Google decided not to presume to negotiate a price, but just do an auction and take whatever price cleared the market, SoftBank decided to just pick a price and offer its stock there. It is sort of the normal way a company offers a product for sale: You tell people the price you charge, rather than asking them what they’d pay. Why not give it a try in capital markets?